Hawthorne Oval 3 Line Personalized Address Sign - - standard size 14.25" x 10.25" personalized home address plaque. Made in USA. Holds up to fourteen 1.5" characters on line 1. Holds up to five 3" numbers on line 2. Holds up to fourteen 1.5" characters on line 3. Lawn mount option includes two 18" lawn stakes. 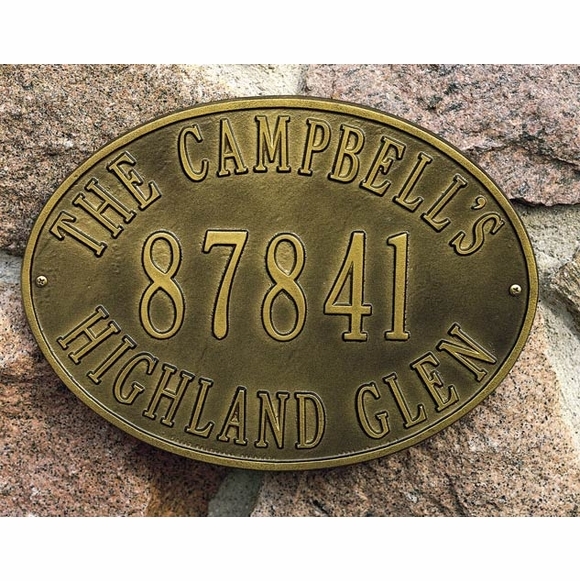 Personalized oval address plaque holds three lines of custom text. Real quality product. Looks so much more expensive than I paid for the sign. I was able to personalize the sign just as I wanted it. It came in a very timely manner as promised. This was a gift and the recipient was thrilled. Will definitely use this company again. This plaque is perfect. Beyond my expectations. Re-painted my house and set it of with this. I'd post a pic if I could. Worth the money. I was very satisfied with the quality of the sign. Very handsome. I was a bit disappointed about the time it took to manufacture it, and would have appreciated a few automatic updates from the company rather than having me to log in to check it out.